A staple on many appetizer menus, calamari, which is made by frying sliced or whole squid that's been breaded, can fit into a balanced and healthful diet. It offers some nutritional value, boosting your intake of minerals and vitamins, as well as macronutrients needed for energy. However, calamari also contains relatively large amounts of sodium and cholesterol, so you should monitor your portion size and consume it only as an occasional treat. Calamari contains a moderate number of calories -- each 6-ounce portion offers 298 calories, which is 15 percent of the daily intake on a 2,000-calorie diet. These calories come from a mix of 30.5 grams of protein, 12.7 grams of fat and 13.2 grams of carbohydrates. Your body uses carbs and fat for energy by converting them to useable fuel to support your cellular metabolism. The protein in calamari nourishes several tissues, including your hair, skin and muscles. Add calamari to your diet as a source of copper and selenium, two essential minerals. Selenium and copper both act as antioxidants, which means that they fight toxic free radicals before they can damage your tissues, and they play a key role in immune system function. Copper also helps your body utilize iron, and selenium benefits your thyroid gland. A serving of calamari provides 3.6 milligrams of copper and 88 micrograms of selenium, more than the entire daily intake requirement for both minerals. Consume calamari as a source of niacin, also called vitamin B-3, as well as vitamin B-12. Niacin and vitamin B-12 both help keep your DNA healthy by preventing DNA breakage, which is a process that would otherwise put you at risk of genome instability. Niacin also promotes healthy cell metabolism, while B-12 supports nerve function and aids in red blood cell growth. A serving of calamari boasts 4.4 milligrams of niacin, which is 31 and 28 percent, respectively, of the daily recommended niacin intake for women and men. That serving also has 2.09 micrograms of vitamin B-12, or 87 percent of the recommended daily intake. While calamari has its benefits, it's also very high in sodium, especially if you pair it with marinara sauce. 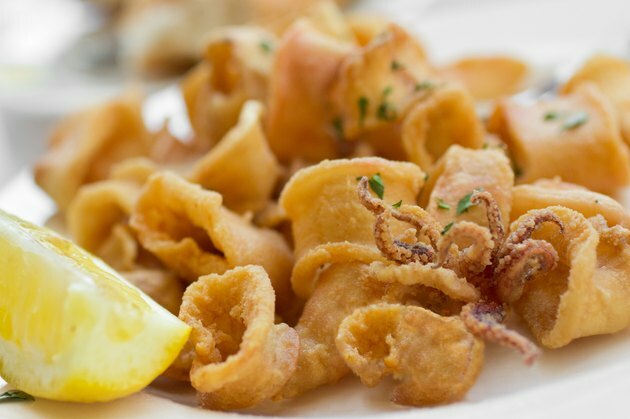 A serving of fried calamari on its own has 520 milligrams of sodium, which is 35 percent of the daily 1,500-milligram limit recommended by the American Heart Association. A serving of calamari with a quarter-cup of marinara sauce contains 797 milligrams of sodium, which is 53 percent of your daily limit. High-sodium foods, including calamari, are best consumed in moderation, because getting too much sodium on a regular basis increases your blood pressure, boosts your risk of cardiovascular disease and damages your kidneys. Calamari is also high in cholesterol -- it contains 442 milligrams per serving, which exceeds the 300-milligram limit set by the AHA. Making calamari a regular part of your diet may have a negative effect on your blood cholesterol levels, due in part to its cholesterol content. Is Farm-Raised Catfish Good for You?